The return on investment that customer training can have for your business is substantial. When implemented, great customer training doesn’t just impact one area of your business. In fact, an effective training strategy for your organization penetrates all aspects of your customer’s lifecycle and reaps big wins for you. 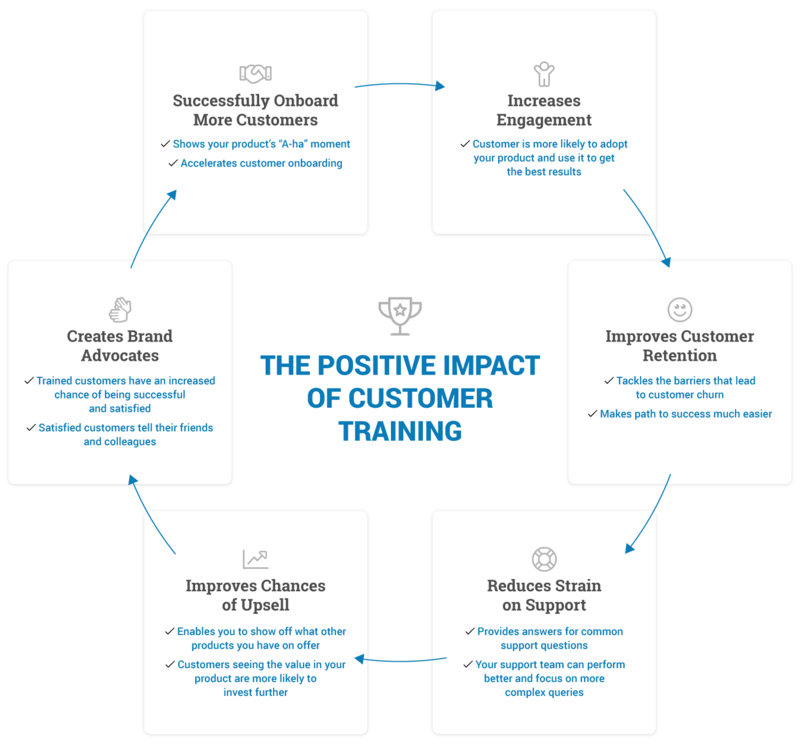 Today we’re sharing 6 powerful ways customer training can impact your business. We’re also showing you how you can measure your training ROI to ensure you are getting the best results for your business. Onboarding training is one of the most important parts of your customer’s journey. And a key benefit of training is that it empowers you to map out a fast and effective onboarding strategy for your customers. It welcomes them, gives them direction, gets them activated faster, and boosts your customer’s chances of success. This improved chance of success comes from showing your customers your product’s ‘A-ha’ moment – the point where your customer sees what the product can do for them. It also enables you to map out their journey and the steps your customer will take to reach this point in a fast and efficient way. A struggle many businesses face is customers who aren’t continuously engaging with their product. Customer training helps eliminate this issue and keeps your customers using your product. From an initial stage, they’re shown the benefits and are as a result are more likely to adopt your product. Providing continuous training on new features or revisions on previous learnings keeps your customers engaged too. They are always reminded of your product, see the value it delivers which, in turn, keeps them interested. One of the biggest headaches for businesses is losing customers. And one of the biggest reasons customers leave is due to insufficient onboarding and product training. If a new customer signs up or purchases your product and are left to their own devices to discover how to use it, there’s a higher chance they won’t see the benefit for them, will get confused, or forget about your product. Groove HQ explain this point particularly well in relation to onboarding. They talk about two milestones for customers – when they sign up and when they achieve their first success with your product. They explain that between these two points, your customer is most likely to churn. This is where great onboarding comes in. Onboarding and product training tackle the barriers your customers may run into when they are familiarizing themselves with your product. It reduces the number of hurdles for customers so their journey to success is as streamlined as possible, and in turn, your business is more likely to retain them. Interestingly, in the same article Groove HQ also mention that poor customer service is a major contributor to low retention. This makes sense. If customers don’t feel guided and supported, it can once again lead to problems. However, great customer support can be difficult to achieve. The faster you grow, the more support queries you get, the harder it is to scale and retain a level of quality you and your customers are happy with. This is where training can help. Onboarding and product training from the get-go can answer so many questions for your customers. If you provide answers to frequent questions through training, it reduces the number of support questions you’ll get on these common issues so your support team can dedicate their time to resolving more complex customer queries. One of the most important assets for growing your business is your current customer base. They’re a perfect audience to cross and upsell to and training is a great medium for achieving this. Offering your customers training on products or features they don’t have and showing the benefits they would get if they added them is an easy and effective way for you to grow your business. Upselling through training is simpler and more cost effective too. You don’t have to spend time, money and energy trying to capture new leads. Your customers already know your business. They trust you, so it’s an easier win. Additionally, you know your customer and the features they’re already using so you can tailor the training to appeal to them, boosting their chances of success. Trained customers have a better chance of success, and successful customers are more likely to be satisfied with your business. Satisfied customers are your best advocates. If you create a training program that helps your customers prosper, you’ll find they will spread positive word-of-mouth about your business which could result in referrals, and ultimately, new customers. At the start of implementing your training with a learning management system, it’s important to assess your past and current return on investment metrics. This gives you a baseline to measure the impact and success your training will have. For a working example, let’s say we want to measure the effect customer training has on a business’s customer support questions. First, we should assess how many queries does the average customer without training log over a selected period of time. With this information in hand, we now have a number to measure our training’s success against. It’s a smart idea to gauge the most common questions and easily answered questions your support team gets. You can then measure if your training is not only reducing queries but also providing the answers your customers want. Once your training is up and running, you can then start to measure its impact on your ROI metrics. With our customer support queries metric, we can use a number of helpful reports. For this example, module completion and learner progression are great reports to utilize. These tell you how far learners have gotten in your courses and what they have completed. From here, you can dive into determining the impact your training has had on support queries. 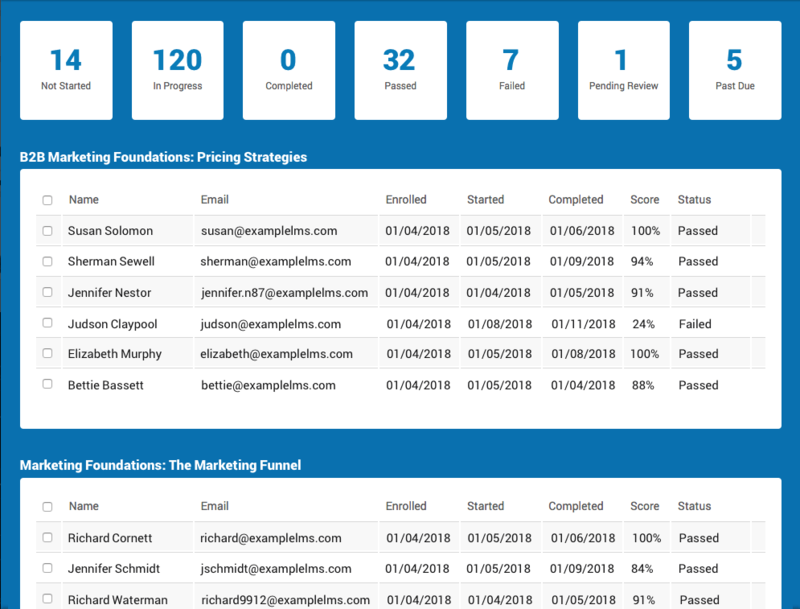 Now it’s time to compare the performance of your customers who have successfully completed training versus those who had not been given training at all. You can compare your baseline number to your training number and see the positive impact training is having on your support resources. You can also drill down further and calculate the hours saved responding to queries and the time your support team gets to spend on more productive conversations with your customers. Dalton Klimp, Salesforce Administrator, Ropes Courses, Inc.
With the right tools and great training, your business could be experiencing the same rewards too.